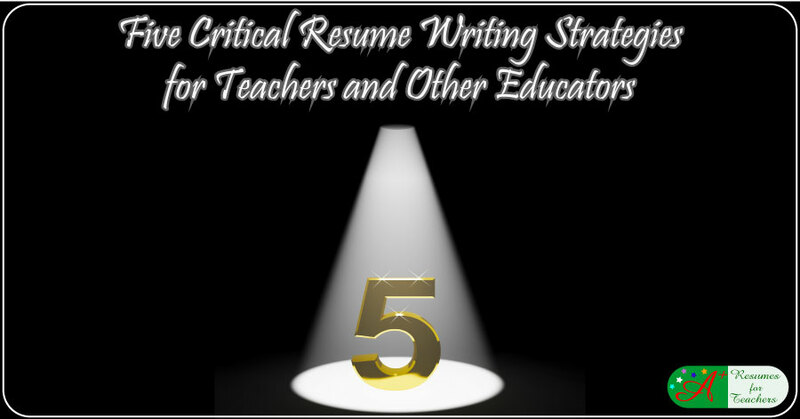 The thought of creating a resume makes most educators cringe. One of the biggest challenges of writing a resume is being objective, and thinking critically about what you have to offer. Writing your resume is one time you need to "boast" about your accomplishments; for many, this is extremely difficult. Don't think of it as bragging, it is simply telling and selling what you have done. The following resume writing strategies and hints will help you get started in the right direction. Once you have completed your resume, you should be able to sit back and review all your accomplishments with a renewed sense of confidence. The information presented in your resume needs to be easy for the recipient to read and understand quickly. Create a highly visible and attention-grabbing summary section - this must be located at the top of the first page. If you know what type of position you are seeking, start with the job title, then use a powerful subheading that really draws the reader into the body of the resume. Load your resume with critical keywords, job and industry specific terms, buzzwords, and jargon. When the targeted institution receives your resume, a preprogrammed computer may be used to search for keywords to determine which resumes will land in the "YES" pile. The person hired may not be the best qualified for the job, but instead the one with the "matching" keywords. Research and find out what keywords are relevant to the position you are seeking. Read job ads, job descriptions, trade journals, and websites. Increased students' reading at grade level by 20% by implementing "home reading" program. Authored and published book entitled, "Open Parent, Staff, and Student Relationships Equal Results." The resume and cover letter you submit must demonstrate and display your "best" work. Would you hire yourself if your resume were in a stack of 1000 others? To ensure professionalism, send a cover letter, and address it to the hiring manager. Make sure the spelling of his/her name is correct. Do not fold your documents - send them in a full-sized envelope. If you are unable to personally deliver the resume, send it by overnight express to make a great first impression. There must be no typos or grammatical errors. Remember, this is an indication of your best work. Write your resume to sell YOU - consider it a critical marketing tool!